The Sammy Hagar-led supergroup The Circle have completed recording their debut studio album. 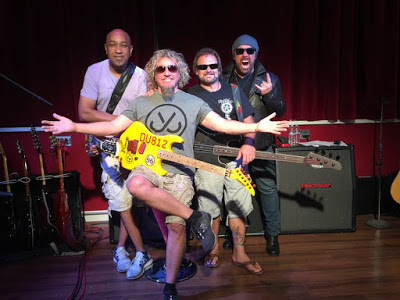 The band – which features Hagar alongside bassist Michael Anthony, drummer Jason Bonham and guitarist Vic Johnson – formed in 2014 to present the Red Rocker’s musical history and Bonham’s legacy by performing tunes by Hagar, Van Halen, Montrose and Led Zeppelin. The group, who issued their first live DVD, “At Your Service”, in 2015, has just wrapped up sessions for its first album of all-original material, according to Bonham. “What he wanted to do was do something very different than he's ever done, which is send you on a journey, like the old days when you put on an album, you listened to it from start to finish instead of just a song – where the placement of each [song] is vital for it to make sense." Further details regarding The Circle’s debut studio project, including song list and release information, are expected in the coming months. Meanwhile, Bonham continues a North American tour with Foreigner and Whitesnake, and The Circle will be headline Hagar’s inaugural “High Tide Beach Party & Car Show” in Huntington Beach, CA on October 6; the recently-announced event will also see a co-headline set by REO Speedwagon, as well as special guest appearances by Joe Satriani, Vince Neil and more.